Below you can also infer that those Fenix watches are probably very profitable. Vivoactive 3 (review here) has just been released to help turn the fortunes of the fitness sector around. No doubt the imminent announcement of the 645 might also help that turnaround too. Despite its bland, non-sporty looks, the 645 should do well (245 even better) but I am not so sure about the Vivoactive 3 (also bland). As I said in the review it’s kinda nice but not spectacular. So the VA3 may well just turn out to stablise Garmin’s position. No doubt next year’s 530 and other models and innovations will also help. Vivofit Jr also may sell well this christmas but I have very serious doubts about the rest of lower end ‘activity tracker’ end of the market for a company like Garmin hoping to achieve premium retail prices. 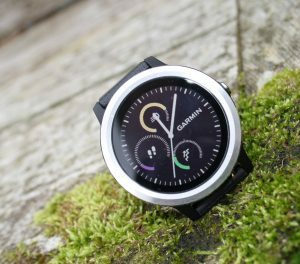 I suspect that Fenix 5 (plus) revenues over the next 2 quarters will also be pleasantly surprising for Garmin shareholders. Another interesting development is the DECLINE of the overall US/NA market for Garmin. Europe is still growing but Asia Pacific has the highest growth rates. The Outdoor sector accounts for over a quarter of Garmin entire profits (operating income). During the third quarter of 2017, the outdoor segment grew 31% driven by strong demand for our wearables. Gross margin improved to 64% while operating margin improved to 37%, resulting in operating income growth of 38%. We recently entered new product categories with the introduction of the Descent™ dive watch, bringing a sleek design to underwater adventurers, and the Impact™ bat swing sensor helping coaches and players make every swing count. Looking forward, we are focused on growth opportunities in wearables and inReach product introductions. Revenue in the fitness segment declined 12% during the quarter, with gross and operating margins of 58% and 20%, respectively. The decrease in revenue was primarily driven by the decline of the basic activity tracker market and the timing of our recent product introductions partially offset by growth in the running category. During the third quarter, we launched several new wearables including the vívoactive® 3, bringing Garmin Pay contactless payment solutions to the wrist, vívomove™ HR, an analog watch with wrist heart rate and smart notifications, and vívosport™, a slim activity tracker with built-in GPS and smart notifications. In addition, we launched our vívofit® jr. 2, featuring Disney, Star Wars and Marvel bands and mobile app adventures, encouraging children to be active. Looking forward, we are focused on growth opportunities in advanced wearables devices.